If you are interested in the Mackays and old railroads, you'll like this piece..
Over time, I have received inquiries from visitors to this site asking what I know about a railroad in Texas that at one time was owned by the Mackays. This railroad is mentioned in Ellin Berlin's book, Silver Platter, pp. 281-282, and can be found using Google. 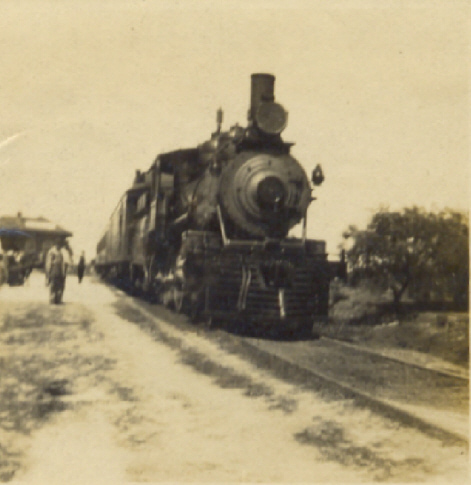 Here is an excellent link regarding the New York, Texas and Mexican Railway. http://www.tsha.utexas.edu/handbook/online/articles/NN/eqn2.html This railroad was built by John Mackay's brother-in-law, Italian Count Telfener, in 1882. It was nick-named the "Macaroni Railroad" because Count Telfener arranged for 1,200 Italian immigrants to come to Texas to work in the construction of the road and then to settle in new towns along its' route. Only 91 of a planned 350 miles of railroad track was constructed but a number of small towns were begun and named after members of the Mackay family. See the Google Earth map below. The railroad began in Rosenburg, Texas, southwest of Houston, and terminated in Victoria, Texas. In 1885 John W. Mackay bought the faltering railroad and sold it to the Southern Pacific Railroad, thus relieving his brother-in-law of a very large financial burden. Today residents of Hungerford, Mackay, Louise, Edna, Inez and Telferner (misspelling of Telfener) all know a little something of the Mackay names. Actually, Mackay is no longer a town, just a memory of a few of the older residents of the area but it still can be found on most Texas maps. Here is a partial email exchange about a related portion of the railroad. Like most railroads, the name has been changed numerous times due to repeated sales and mergers. Enjoyed your site and info on the Macaroni Railroad in Texas. I am searching for info about my grandfather, who lived in Victoria, Texas and was an engineer on the railroad that passed through there. The paper said it was the "G. H. & S.A. branch of the Sunset-Central Lines." Anything you know would be greatly appreciated. Bill - Thanks for the reply. Last night I found that G. H. & S. A. stands for The Galveston, Harrisburg and San Antonio Railway Company and that it was chartered on July 27, 1870. I have also located a note, hand-written by Joshua showing he was a fireman on the railroad from 1903 to 1913 and was promoted to engineer in 1913 and held that position until his death in 1943. 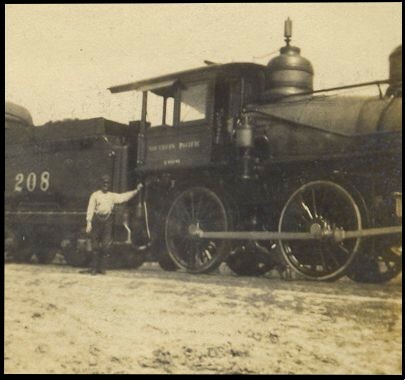 The two photos below show engine SP 208 (Southern Pacific). Phil's grandfather Joshua is standing next to the cab in the second photo. Joshua's older brother Vincenzo helped build the New York, Texas and Mexican Railway beginning in 1882. The rest of the Bianchi family arrived in Victoria, TX in 1885 via Houston, TX and Rosenberg, TX using the 91 mile section of track built in 1882 by the 1,200 Italian immigrants employed by Count Telfener. 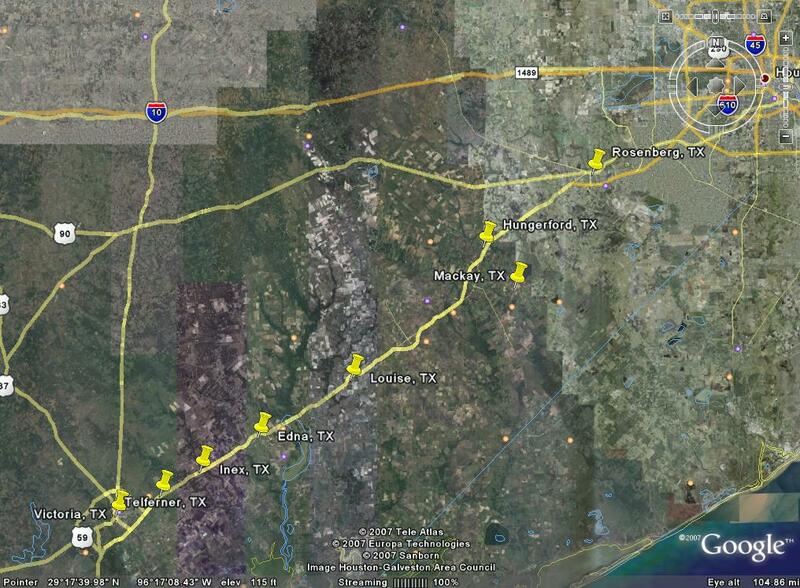 Victoria, TX Yellow pins show names of six towns named after Mackay family members.